The bear market is showing signs of waking up and, for one, it means the days of setting up your trading desk to short volatility and then going to play golf are over. That was the topic of a new report released by Bloomberg this morning, who made note of a couple of signs that indicate that the bull market's best days could be behind it. It also noted that this year, the average down day for the market has been 24 percent bigger than the average green day, the biggest delta since 1948. 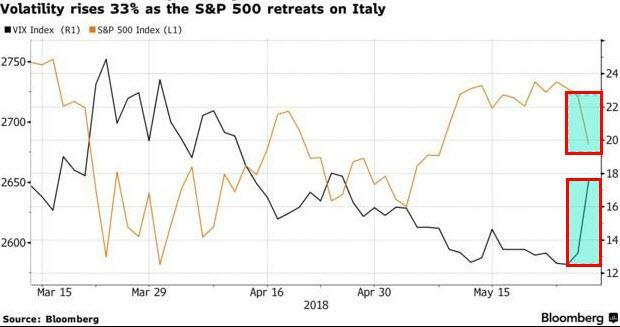 With the market casually shedding 400 points yesterday on the unrest in Italy, it was confirmed that 2018‘s market is very different than 2017‘s market. 2017 was the market of "the Target manager making money by shorting volatility" and 2018 is the market of "not knowing which day volatility could creep out of nowhere and slash the market lower by more than 2% in a single session". None of the narratives floating around the market make any sense. Bond yields are too high, and too low. Politics don’t matter, then they do. There’s excessive inflation, or not enough. But one message the market keeps sending: don’t get comfortable, because around the corner is pain. 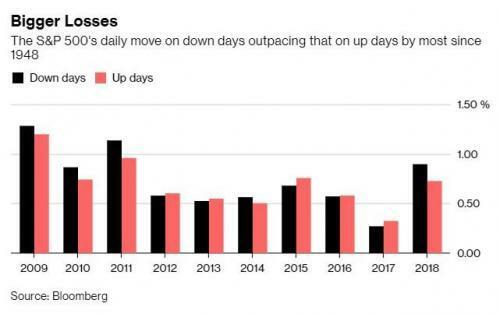 Stock traders have been chained to their screens in a year when the average down day is 24 percent bigger than the average up one, the biggest gap since 1948. It played out again Tuesday as investors were treated to a session of price swings that would have ranked with the worst of the preceding two years -- but in 2018 doesn’t crack the top 20. Phrased differently: the biggest decline in the S&P 500 last year, a 1.8 percent drop on May 17, would rank as the eighth largest since January. And it’s only May. Only one thing has been constant in 2018, that every few weeks equities get hammered. U.S. companies are in the midst of one of the biggest earnings expansions ever, everything from buybacks to capital spending is surging and forward valuations are cheap. But it’s proving little barrier to intermittent wipe-outs. Importantly, it seems as though sentiment is changing so that investors are expecting volatility now. This is a big change in the market's psychology and often can lead to capitulation and a self-fulfilling prophecy of more volatility to come. It often seems as if good news is right on the verge of drowning out the bad. Like last week. Moods in the market brightened. The VIX eased. Data from Investors Intelligence showed newsletter writers classified as bulls reached the highest in almost two months. Statistics from Ned Davis Research Inc. reflected a similar trend. Everyone’s favorite stocks, the Faang block, vaulted to records just last week. Then political uncertainty in Italy flared up, sending ripples across Europe. And the S&P 500, which had swung an average of 0.3 percent the previous 10 sessions, fell four times that on Tuesday. The Cboe Volatility Index spiked 29 percent, the most since March, to 17.02. Ten-year yields dropped by the most since at least November 2016 to 2.78 percent. Half a month ago, when yields were at 3.1 percent, such a decline would probably have sparked an equity rally. Not Tuesday. Also not helping the cause was the fact that hedge funds turned net short of the VIX right before it spiked. 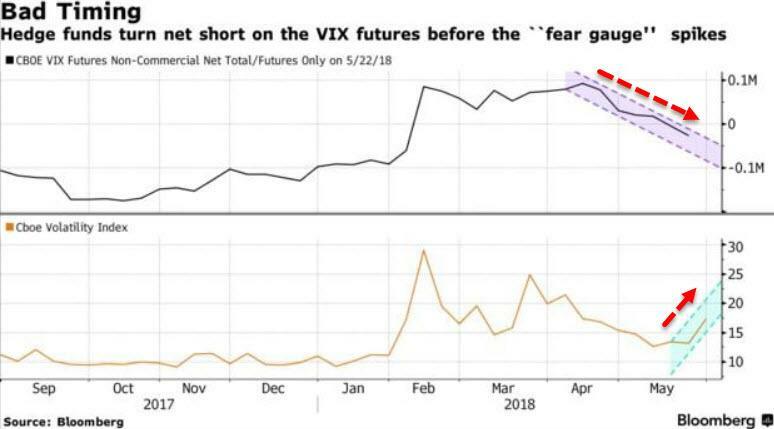 Speculators turned net short the VIX futures this month, a bet that pays off when markets stay peaceful, data from the U.S. Commodity Futures Trading Commission show, after being long since late January. Investors in volatility exchange-traded funds did a little better. They put $265 million into the iPath S&P 500 VIX Short-Term Futures ETN in the past four weeks, after withdrawing from the product for five straight months. The VelocityShares Daily 2x VIX Short Term ETN posted four weeks of inflows in a row, the pattern unseen since October. It "almost never happens" until, of course "it happens". The sleeping bear seems to be awakening, even if it is only slowly. The fact that traders are far more glued to their desks now than they were last year shows a rising level of concern, and with good reason. The larger swings in the market this year - again, the largest since 1948 - can sometimes be looked at as precursors of recessions and prolonged volatility. This change in sentiment will go on to ensure that volatility may be a self fulfilling prophecy going forward for the remainder of the year.